WorkForce Fatigue Management tracks employee hours scheduled and worked, as well as absences and activities performed. Monitoring this data in real time, the solution proactively alerts managers and/or HR personnel when an employee is at risk of exceeding work-hour guidelines. Labor data can be directly entered or seamlessly imported from other systems and employee time clock devices. Organizations with sophisticated business risk management strategies can leverage WorkForce Fatigue Management to calculate precise, dynamic fatigue scores for each affected employee. Tracking and reporting on these scores delivers much greater insight into the depth and prevalence of employee fatigue across your entire workforce and helps fine-tune prevention techniques. Our fatigue management software offers several ways to ensure that employees with heightened fatigue risk are carefully scheduled, if at all. 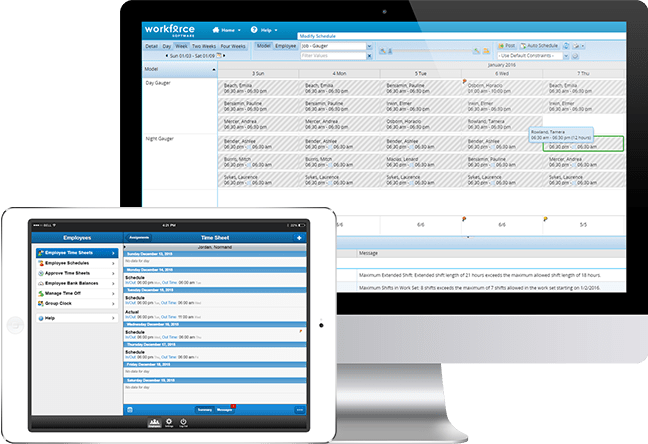 When paired with WorkForce Advanced Scheduler, you can prohibit managers from scheduling potentially fatigued staff, or require them to acknowledge the risks before overriding an alert. Eligibility can be configured down to the activity level, providing maximum flexibility. Another advantage of pairing WorkForce Fatigue Management with Advanced Scheduler is that you can automatically factor fatigue risk levels into the call-out sequence for filling an open shift. This allows you to take advantage of highly efficient automated call-outs while ensuring that only the safest employees are notified of additional shifts. Bundling WorkForce Fatigue Management with WorkForce Analytics makes it easy to analyze the impact of employee fatigue on costs, quality of work, and other performance measures. These insights can then help your team refine scheduling and staffing practices to reduce the ill effects of employee fatigue and strengthen enterprise risk management. Our experts can help your organization review labor schedules, work environments, and job responsibilities in order to ensure a solution precisely matched to your needs. Similar risk assessments can be conducted post-deployment, as well, to ensure ongoing alignment between safety and your evolving operations. Our Workforce Management Trend Survey survey respondents indicated that fatigue management is a serious issue. Leverage employee time and labor data to proactively monitor and manage fatigue-related safety and compliance risks.